On your left as you come up Great North Rd, just before Titirangi Rd going west, there is a cluster of restaurants serving great food – noodle houses, dumpling joints, a kebab shop. There’s also a dairy, a barbers, a vape store, a locksmith, Woottons Auto Accessories and two kinds of tool stores. This strip has got a little bit of something for everyone, including poetry and spoken word fans. On Saturday 16 September it will play host to a spoken word, poetry and food walk, Tasting Words. Six poets will perform their poetry, the restaurants (and the dairy) will share their food. Amy Weng briefly caught up with five of the six poets to talk about this sensory experience, their creative processes and the role that food and poetry plays in their lives. UPDATE: Tickets are now sold out for this event. 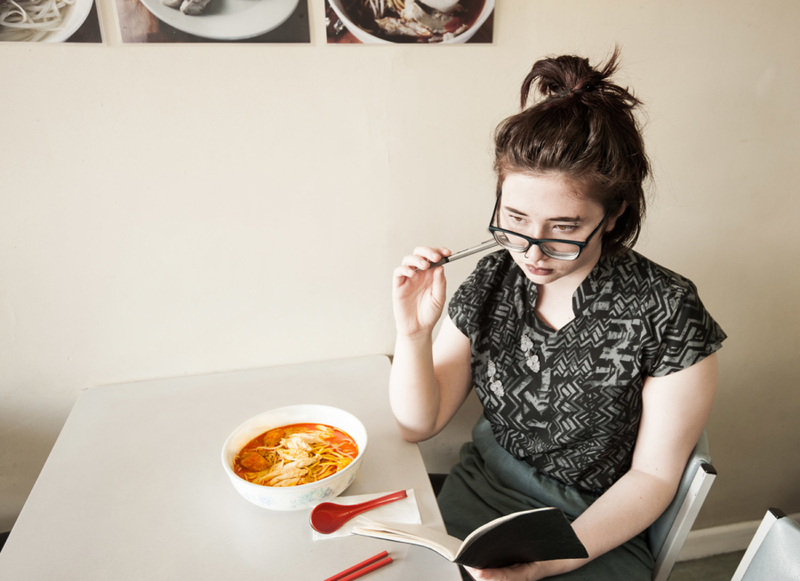 Amy Weng: How do you see food and poetry coming together for Tasting Words? Mustaq Missouri: Food and poetry, or literature in general, I think serve the same basic function, in that it allows one to survive and thrive in the world. The former is obviously of a physical nature while the latter provides nourishment for the creative mind. I see both to be equally important. In the same vein, then, the idea of combining poetry and food in Tasting Words is quite a logical one. They have a natural connection with one another. I hope that the audience and everyone else involved in this will come out of feeling full and satisfied on both fronts. Vanessa Crofskey: Food is one of the most immediate means of accessing a culture. It’s evocative, nostalgic and highly sensory, which makes it a perfect starting point for poetry. I’ve never really seen an event – in Auckland or otherwise – that pair the two forms together like this. But it’s something that makes a lot of sense. Like the large smorgasbord option at a Chinese Takeaway, except ideally more authentic… or not. I think the ways that cultures orate stories, as well as prepare and ingest food are deeply personal and highly sacred. They’re both tactile means of sharing knowledge. Food connects people in a way nothing else can – so I’ll be interested in the sense of communal experience this collaboration develops. Renee Liang: Food for the brain and food for the body – why doesn’t this happen more?! My piece, Mr Zhou’s Kitchen, examines the immigrant journey through the metaphor of cooking a dumpling meal – which guests will hear while eating dumplings made by the subject of the poem, Mr Zhou himself. AW: Food is a great way to initiate a conversation – its comforting as well as playing an important social function. What role does food play in your home? VC: In my house, food is the way you show love and appreciation. I’m far more responsive to a chorus of “have you eaten?” than to any random outburst of love from a family member. I don’t know if my family was ever natural at expressing themselves the way Western cultures might – but I never missed out on love growing up. Our pantry was always full to the point of bursting, favourite foods stashed away in heaving bags of groceries. My favourite dish is mee hoon kueh, because it’s a memory of morning tradition: tearing the dough with my mum and watching something to feed your body bubble to the surface. It’s a process of reclaiming history. AW: Someone once told me that it might be a mistake to think that the literary history we should be connecting with is the European settler history. It’s often said that the genesis of New Zealand literature comes through people like Charles Brasch, Allen Curnow and Dennis Glover, but are these the writers we should be connecting with? I often think about this with my own writing. So- who are the poets that are the source of your inspiration and genesis for your work? RL: I did try reading these canonical authors, but found they just didn’t resonate with me, nor did their vision of New Zealand match my own experiences. I love the poetry of Hone Tuwhare for its honest earthiness coupled with his gift for hitching on to the human soul. Janet Frame for her searing vision and mindblowing facility for language. I also read international writing a lot, especially writing that speaks to the Asian immigrant experience – I treated Amy Tan’s novels almost as textbooks growing up. Maria Ji: Ada Limon, Janet Frame, W. H. Auden, and Anna McDonald are some of the poets who have been on my mind for the last few years. But when it comes to the source of my work’s genesis, it’s rarely a specific poet or poem. I might steal some syntax or structure from other poets, but I think content-wise other things tend to drive my writing. AW: Can you tell me a bit about your creative process for Tasting Words? Joanna Li: I delved back into the diaries that I wrote when I visited China, as well as going through my parents’ photo albums. For me, food is inseparably tied to culture, so it was easy to tap into the emotion about it. All I needed were memories, photos, and a good plate of my ma’s home cooking! MM: I don’t think I have a creative process as such for this event. I’m predominantly an actor and have never done a poetry reading of my own material to anyone, let alone a paying public. So I’m approaching this with feelings of slight trepidation and nervousness; however this is tempered by a sense of excitement and gratefulness for having been given the opportunity to do something new. And I’m especially looking forward to hearing the other poets in this event. I’m sure it’ll be a sumptuous treat. RL: Mr Zhou and his daughter Linda kindly gave up an hour of their Sunday afternoon to talk with me. Linda translated my questions as I don’t speak Mandarin Chinese. I asked Mr Zhou about his life story, how he acclimatised when he immigrated to NZ, his dumpling secrets (he didn’t give away much) and how he built his business. Following this I wrote an 8-sonnet cycle. Mr Zhou is from Dandong, which is on the South China Sea facing across the river from North Korea. Godwits – those miraculous birds who burn their own internal organs making the non-stop 11,000 km flight from NZ to Dandong every March – become something of a metaphor in the poem cycle. AW: How did you get involved with writing poetry? Where did it start, and how does it fit with what you do for a living? JL: I’ve been writing since I was very very young – short stories and prose at first, and then poetry afterwards. It started as a release for emotion – once a feeling was written down it seemed easier to manage and understand. I’ve been very lucky to have many English teachers over the years who have been supportive of my love for writing, even as a student. MJ: I started writing poetry as a part of a course in high school. My teacher, Ros Ali, would encourage her students’ imaginations to run wild… and then lawn mowed whatever we turned up to class with into something publishable. She was kind about editing, though. She had a thing about never using red pen and all her edits would be pencil. I think I learned a lot about writing and the culture of it in those years. At university I dabbled in spoken word, competing poetry slams and being part of a poetry show in Auckland Fringe Fest. I was never a wallflower kind of person, but these experiences did help me be more confident. Who knew writing poetry would have that outcome? The stereotype poet is of some sensitive soul wilting indoors, after all. I’m not sure how poetry fits in with being a med student, but it does give form to things that are hard to say. Recently I had to do a cognitive assessment of a patient who had just found out she had a terminal illness with a poor prognosis, and one of the tasks she had to do was write a full sentence. Any sentence of her choosing, and she wrote, “I would [like] to be able to fix myself.” She didn’t get the point for that task because she omitted the verb [like], which was one of those heartsink moments. Because I knew what she had meant. AW: For those who have never been to a poetry reading before, what advice can you give them to go see one? JL: To relax, and have fun! There’s a stigma around poetry that it’s only meant for the educated, or what it’s highly elite. While it’s true, and regrettable, that poetry has had a history of being exclusively for the upper classes, its face is certainly changing. The purpose of poetry is an outlet for emotion – therefore, poetry is meant for everybody to write, to listen to, to read. RL: The longest-running regular poetry reading in NZ is Poetry Live, from 8 pm every Tuesday at the Thirsty Dog in Ponsonby (koha entry). This is a pub atmosphere so if your taste is more cafes or you’re a young person, there are tens of other readings, slams, workshops and events every week – just google the local events listings. MJ: Tasting Words isn’t your typical poetry reading so my advice doesn’t really apply. But for more conventional poetry readings my advice would be: eat and drink beforehand, take some cash in case you fall in love with a reader’s works and you want to buy their book or zine (“no we don’t have an eftpos machine” is a very depressing but all too commonly heard phrase at smaller poetry events). And go with a friend. Because poetry readings can be like rummaging through an op-shop – very hit and miss. But you might discover a gem that you keep for life. Or that changes your life. You never know. Renee Liang is a prolific writer who believes in the power of arts and communities. She has toured seven plays, written three poetry chapbooks, edited eight anthologies of migrant women’s writing, and recently wrote the libretto for both The Bone Feeder opera and Dominion Road the Musical. Joanna Li is a young poet. in 2016 she was a member of the Michael King Writers Centre Young Writer’s programme and was also awarded a NZ Society of Authors Youth Mentorship for 2016. Maria Ji is an Auckland-based writer, illustrator, and medical student. Her works have appeared in various publications including New Zealand Poetry Society anthologies, Potroast, Signals, and STARLING. Vanessa Crofskey is a performance artist and spoken word poet. She is a member of Thursday Girls, the team who present Fake American Accent a monthly poetry reading at the Basement Theatre. Mustaq Missouri is a writer and actor who moved to New Zealand from Shanghai in 2014. He’s performed with Prayas and at the Pop Up Globe. Most recently he played Ahmad in Dominion Rd the Musical. Jin Xu is a writer and doctor based in Auckland (Jin did not participate in this interview). Tasting Words is made possible by the Whau Local Board through the Whau Community Arts Broker.